Harvesting potatoes should be done carefully to avoid cutting or damaging the spuds with your shovel. Potatoes are more difficult to harvest than other vegetables because you can't see them before you dig. Therefore, you have to rely on the appearance of the foliage. Potatoes can be harvested during 2 different growth stages. For new or baby potatoes, you should harvest 15 days after the plants have finished flowering. 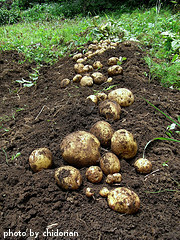 For full-sized regular potatoes, harvest 15 days after the foliage turns yellow and dies back. Use a shovel or digging fork and dig about 1 foot outside the row. Turn over the soil and search through it to find the potatoes. 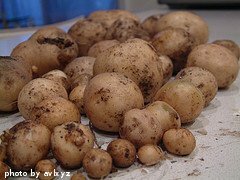 After collecting the potatoes, shake off the dirt and place them in a cool, dry area for 3 days. This will allow the skins to cure, which will protect the potatoes during storage. Do not wash off the potatoes with water at this time. It's better to wait and scrub them shortly before cooking. Remove the dead potato plants from your garden and add them to your compost pile. After the potatoes have cured, you can store them for several months at around 40 degrees F in a well ventilated area. Remember, it's always better to harvest potatoes a few days early instead of a few days too late. If you're wanting full-sized potatoes, you certainly want them to reach their maximum size. However, the longer they stay in the ground, the greater the chance of something bad happening to them - pests, wet rot, etc... If there's rain predicted in a few days and your potatoes are close, go ahead and get them out of the ground before it rains. The same thing applies to a heat wave - dig them early before the weather becomes unfavorable. Potatoes can be canned or frozen. To freeze, peel them first and blanch whole potatoes in boiling water for 3 minutes. Then plunge into an ice water bath to stop the cooking process. When the potatoes are fully cool, pat dry and store them in airtight bags in your freezer. Now it's time for some of our favorite potato recipes.